Enjoy an artful reminder that you're beautiful inside and out with this hand cut three-dimensional display. Inspired by a public art movement, artist Matthew Hoffman created this beautiful reminder. 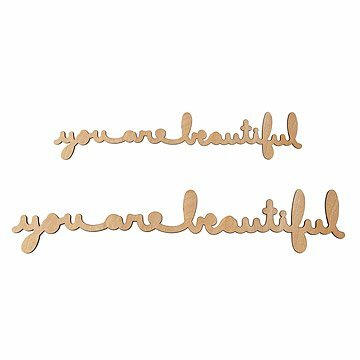 What began as a series of stickers affixed to unexpected public places became laser cut wall art that brings confidence and beauty to your own home. Highlighted by a charred finish and cursive silhouette, this three-dimensional wall art serves as a sweet compliment in your bedroom, powder room, or wherever you might need a simple confidence boost. Handmade in Chicago, Illinois. 2 Foot includes foam tape squared for direct application to wall or other surface. 3 foot has mounting holes for to be screwed into wall. Does not arrive with screws. I wanted this to hang above my mirror at my hair salon...it's perfect! I have been eyeing this art for years and was waiting for the perfect time, space, and budget to splurge on it. When I got a new job I decided to do it and hang it in my new office. I was so excited to see it and hang it on my wall. When it came, I was disappointed to see it was made from multiple pieces of wood in the middle of the words and it was cracked at that spot on the back, but not visible from the front. Because of this crack, the piece was not sturdy and I had to be very careful when handling and hanging it so that it wouldn't crack completely in two. It still looks beautiful and I love it, but am still disappointed with the quality. I love the product. Is exactly as pictured. This a great reminder to my wife that she is beautiful every day even when I forget to tell her. I want to suggest it to all who have an empty space on the wall near where you or partner gets ready for a confidence boost. I gave this to my niece for her bday. Since she's 12 it was nice to find something fun, cute and positive. She plans on painting it to match her room. She really liked it. The product is beautiful, but too easily broken during shipping. I tried twice, but gave up. Would have liked to have given this to my friend as a gift. My sister cried with joy upon opening the box. It was well constructed and shipped quickly and packaged effectively. Great gift daughter loved it, attached to mirror. attached to mirror so every time she looks in the mirror she sees she is beautiful.